Homemade beef barley soup is like a hug for your tummy. They say the way to a man’s heart is through his stomach. If that is true, then I have my husband’s heart in a bowl. He loves this hearty beef barley soup. When I am planning our menus for the fall, this is the first item on the list. As a matter of fact, it’s so delicious, it’s a “must make” on our menu every single month, regardless of whether it’s -20° out 100° out. It’s easy to make in the mornings, throw in the crockpot, and get on with our busy day. We can add some homemade biscuits or cornbread and have a complete, easy meal! Top those with dandelion or basil butter for an additional flavor treat! 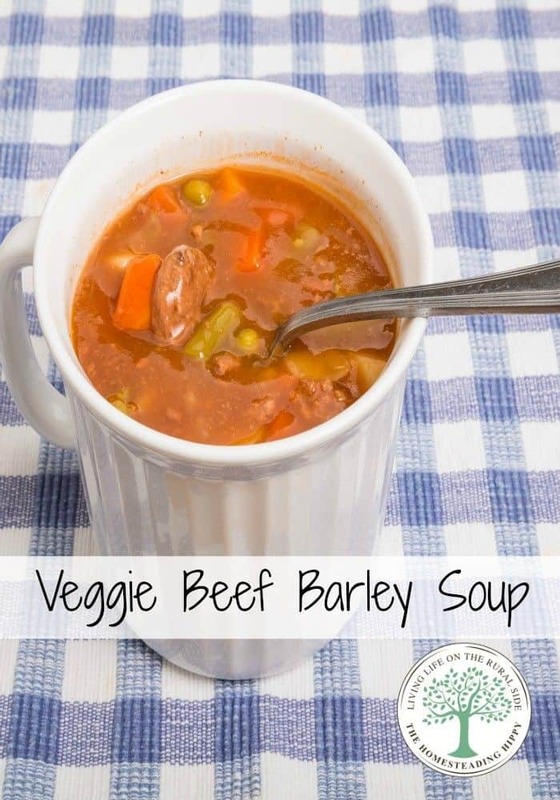 This vegetable beef barley soup is so filling, and delicious. It is one of the best soup recipes, especially for cooler fall weather. You can also tweak it to suit not only your tastes, but what you have in the fridge available. That’s what soups originally started out as, a way to stretch leftovers into another meal and avoid food waste. That one single carrot, or 1/2 an onion you have go great in here! That’s the best part of this simple soup recipe; you can adjust to fit what you have on hand. You can try each one and see what works best for your tastes. Use 1:1, just like you would for the red wine as a pan deglazing and flavor enhancer. Any of them will make this vegetable beef barley soup taste great. Another swap-out you can do is for the red potatoes. If you don’t have red potatoes, you can substitute white or even sweet potatoes for them. If you need to watch your carbs, try swapping out the red potatoes for 1 pound of quartered radishes. 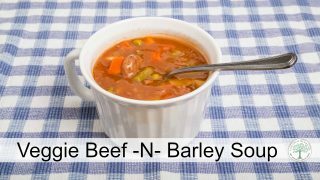 If you don’t have a crockpot, you can also make this vegetable beef barley soup on the stove top. Simply follow the directions to put the soup together, then simmer on the stove on low for 3-4 hours. Rich with grass fed beef, garden fresh carrots and potatoes, and barley, this soup is a fantastic way to warm your heart and soul on a cold winter night. Begin by setting out the stew meat at room temp for 20 minutes. Chop the onions, garlic, celery and set aside. Peel and "coin" the carrots and set aside. Quarter the potatoes, and set aside. Salt and pepper meat generously, and sear on each side in a hot pan. Remove meat from pan, and add to crockpot. In the same pan, add tallow and melt down. Sautee the onions, garlic, carrots and celery for 3 minutes in pan. Add the wine and tomatoes and deglaze the pan. Bring mixture to a slow simmer and remove from heat. Add to the beef in the crock pot. Add potatoes to the crockpot and cover with the broth. Bundle the fresh herbs and add in with the bay leaves. During the last 1/2 hour of cooking, add in 1 cup of barley and continue to cook until barley is cooked through and on the soft, chewy side. Remove the bay leaves, and herb bundles and serve. 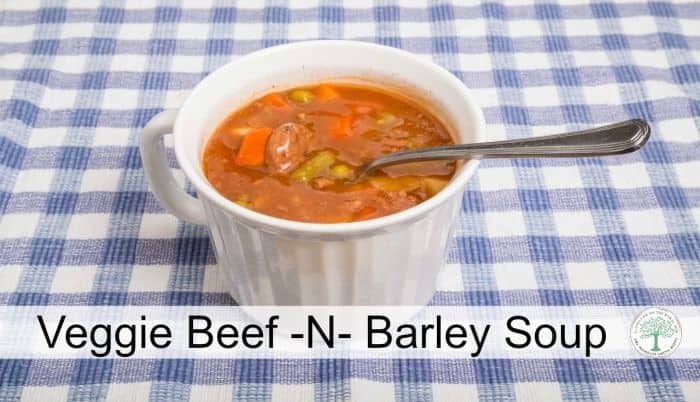 Ready to try this homemade vegetable beef barley soup? That looks so good! With the cold weather picking up, I’m totally in a stew and soup mood! I just found some barley in the pantry which I need to use up. I’ll definitely try this!